Saturday evening we headed out to our favourite winery to see the Peninsula Players “One Flew Over the Cabernet”, an evening of madness, music and mayhem! The Bistro at Muse Winery (musewinery.ca) provided a wonderful buffet dinner prior to the show. The outdoor Bistro setting next to the vineyard is absolutely delightful with friendly, helpful staff. After a relaxed 90 minutes of culinary delights, and an excellent bottle of Muse Winery's Cabernet Sauvignon, we were ready for the 7:30 pm show. It is held on a stage in the open-air Ortega room, under cover of a couple of parachutes to shade the audience from the mid-summer setting sun. Last year we attended the very funny and entertaining “Suddenly Sasquatch” in the same venue. Our expectations were high this year and we were not disappointed. The small troup of actors, singers and performers put on quite a show. Sasha Moriarty-Schieven, the playwright has an incredible imagination and ability to pull together the most zany stories that bring out laugh after laugh. 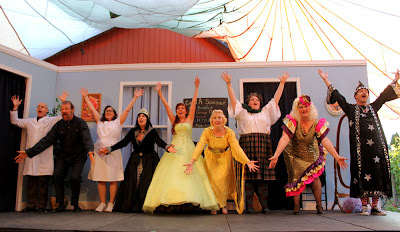 "Brilliantly campy" are the words Linda used to describe the play. The story takes place in the Cabernet Insane Asylum and it seems patients and staff alike are crazy to the end. The music is fabulous and Yanik Giroux, the music man, does a masterful job of providing the background music while being woven into the story in his own special role. It takes a great team to pull off a production such as this, so kudos go to all involved. We encourage anyone that reads this article to take in one of the remaining shows for 2013. Choose from Aug 10, 11, 17, and 31st. Be sure to also book into the Bistro for their amazing buffet dinner and certainly try some of the winery's award winning wines. Once you have experienced one of these great evenings in this very special venue, you too will be one of the annual regulars who attend. It is very likely that most performances will be sold out, so book early. You can find out more by calling the Muse at 250 656-2552. Owners Jane and Peter Elman have created a winner of an evening! For more pictures of this event, please go to our Facebook page. Enjoy.